my Ink well: Congratulations, Tim! I made this card for a very special young man - the son of a dear friend who graduated from the University of Scranton in 2014. This is a (very) belated graduation/congrats on your new job card. LOL. At the time, my boys also had a graduation and I never got around to making a card for Tim. He is the rare young adult male who appreciates my cards, so I love to make them for his special occasions. He has been searching for a job in his field for 2 years, and he finally just landed a great job in his field, at a great company. I finally set to work on a congratulations card for him. Better late than never! I LOVE the way it turned out. I sprinkled Brushos on some heavy watercolor paper, then I sprayed it with Tattered Angels Iridescent Gold Glimmer Mist. I then embossed fireworks from The Ton's Pyrotechnics set in silver with gold detail. The Paper Smooches sentiment is die cut and inlaid. The entire top panel is popped up on white fun foam. Add some texture to your creations! Thanks for coming by. Have a great day! hello Stephanie....better late than never...it is always a good thing to encourage others! the background is fabulous, luv the embossed star burst...fun! so glad you played along with us at simon says stamp wednesday challenge! Sure he will appreciate your thoughtfulness. Love the use of Brushos with the silver embossed bursts. 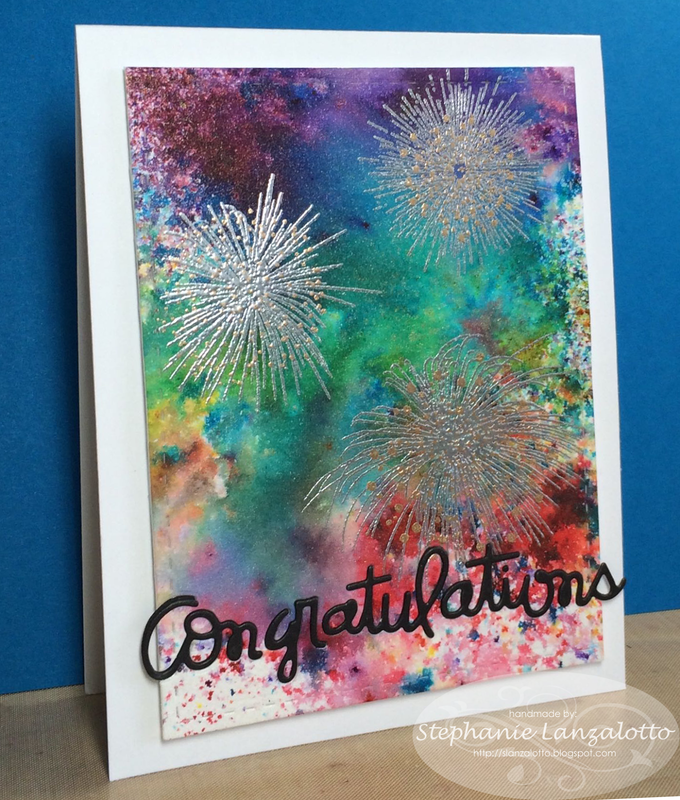 This is a fabulous congratulations card, love the brusho background, so vibrant. Your card is infused with explosive celebration and congratulations, from the vibrant colours, to the shimmery fireworks, to the eye-catching sentiment. How wonderful that he's landed what sounds like a 'perfect fit' job; the best things are worth waiting for. He'll love your card - and especially, your thoughtfulness - as do I! LOVE this - I must try this with my Brushos - I'm just getting into them. Thanks for the inspiration. Tim is gonna love this card!